They say a Model Railroad is never finished! It has been a year since I posted an update. 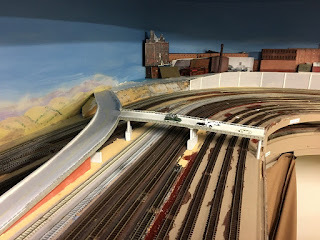 In that time I have had several operating sessions, worked on a number of my NMRA Achievement Program Awards, detailed and scenic several areas of the layout, and enjoyed reliable running of the trains. Some days I will spend adding lights to a structure whilst allowing several trains to run. Sometimes I will tune locomotives to make them consist (run together as multiple engines) better. 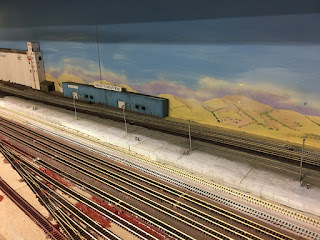 Although the layout looked complete there is still a lot of detail to do. You (I) can spend a whole day adding a few people to a building or street scene. Installing miniature LEDs in building can be quick or if you want to separate light in rooms can take all day. There is however an area of the layout I have never been 100% satisfied with and it has caused me some pain. Under the city I have three tracks that circle around and there are two hidden switches powered by Tortoise switch machines. 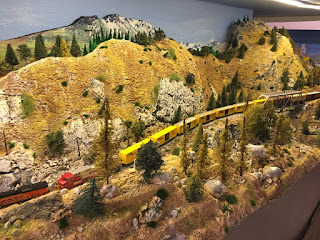 If I get a derailment it is mostly here. A derailment means getting under the layout to retrieve the derailed trains: painful. The latest Model Railroader magazine (May 2018) has an article on basic layout design. They defined three shapes: The Island (where you can walk around all sides), Around the Walls with Peninsula, and Twice around and Return loops. My layout is basically the latter. It has worked well. Visitors can enter and the wide aisles give good movement. However as it is open the two return loops near the entrance to the room are wider than I would like. 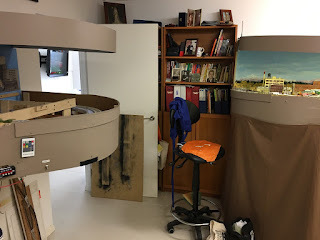 An Around the Walls layout however has one major disadvantage in that you need to "duck under" or have a lift out section or gate to enter the room. I never wanted this, but the article recommended this layout. This got me thinking about my returns under the city and whether I could amend my plan to save this issue. The more I doodled with plans and using Xtrakcad the more I became convinced I should do it. 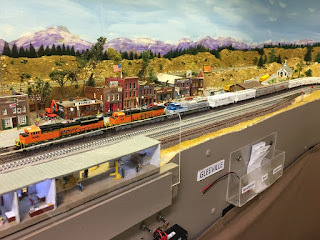 Raising the mainline and yard areas and wiring will be relatively easy. 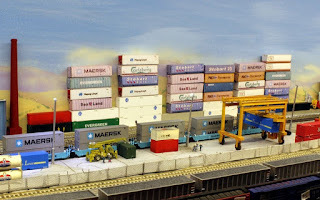 Building a new city and container depot and industries will take a little time but that is the fun of the hobby.The main issue I have to solve is how to manage the swing bridge or duck under at the entrance. I have researched several designs but I think it will be a bespoke design engineered as we build. They say the hardest thing about making a decision is deciding to make a decision! So, I am moving forward and 2/3 of the locos and rolling stock are in their original boxes and stored away. Here are some photos of the early stages. It only took a few hours to go from a "finished" layout to the pictures below. This is the entrance to the room and between these two sections we will have a swing bridge or duck under. Note the barren area on the left where the city was. I removed the city area which was above one of the returns. 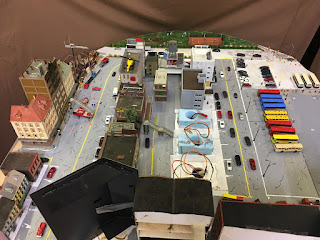 Fortunately I built the city on a removable piece of plywood. Here is the city before removal. 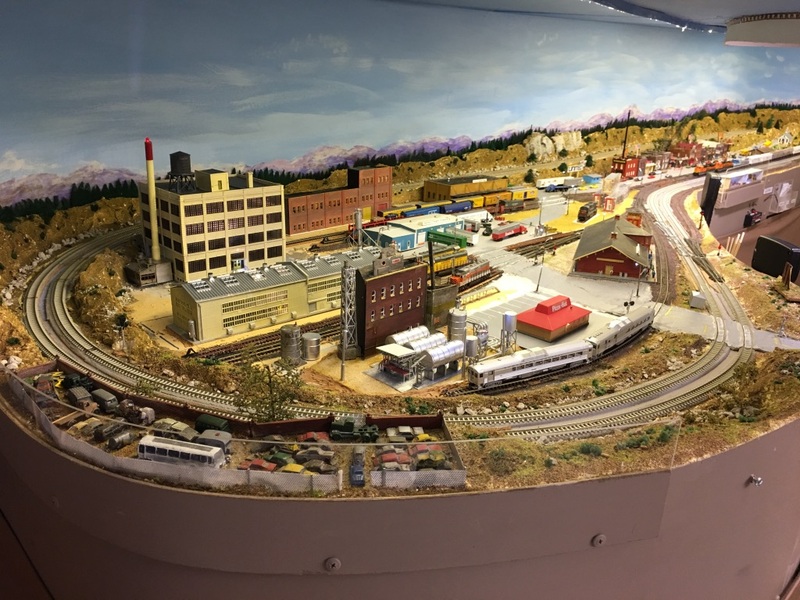 Here is the city minus a few of the "skyscrapers" and Leeville station. It will be painful to undo a lot of the detail here but hopefully the city park can be saved as is. There are perhaps 100 lights in this city. This is the other return near Gleeville where the new tracks will join via a swing bridge. 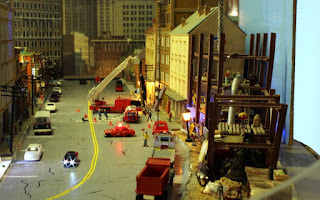 I need to remove some scenery and the scrap yard I built. At Gleeville I have parked one of the mixed freight trains. The Feather River will remain and another mixed freight is parked here for now. Removing the container depot and building from this area was hurtful. The track left and above the road to the bridge will all be raised 50-60mm. 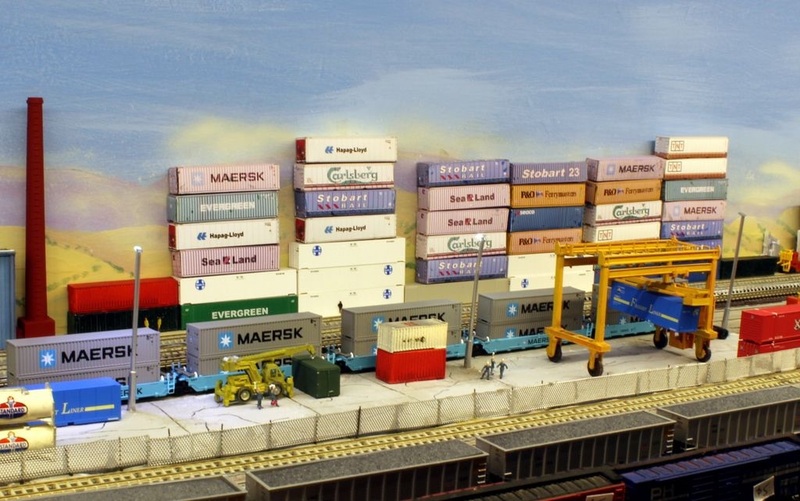 Here is part of the container depot before removal. 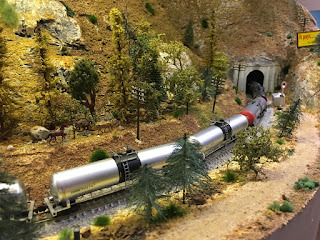 Similarly here all the back half of the layout will be "dug up" and raised 50-60 mm. Scenery in Feather River will not change. How many horses can you see in the trees? This is a quick update. 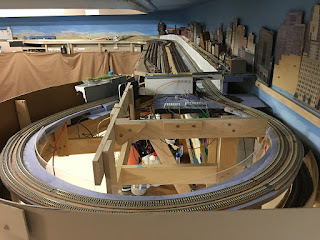 Next steps are to disconnect all the wiring of the sections to change, remove the track and buildings, store what scenery I can save and then cut the baseboard and raise it 50-60mm. This is no small task and hopefully can be completed relatively cleanly. Once I have the new baseboard in place I can lay out the tracks and switches and position the swing bridge. A lot of potential hiccups but will continue to blog with updates.